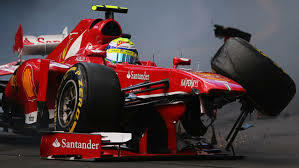 Accoring to reports in AUTOSPORT, Felipe Massa's violent crash during the Monaco Grand Prix was caused by a technical problem on his Ferrari and not due to driver error. The Brazilian was immediately taken to hospital for precautionary checks, having suffered neck pain after slamming into the Saint Devote barriers on lap 29 of the Monte Carlo race. Ferrari technical chief Pat Fry underlined that this time the car was to blame after the crash which looked almost identical to his accident at the same corner during Saturday morning practice. "Today's accident looked very similar to what happened in the third free practice session, but in fact the two incidents are very different," said Fry. "Unlike yesterday, it seems that today's incident can be attributed to a problem on the left front corner of the car. "It's too early to say precisely what happened and in the next few days, we will try and ascertain the exact cause back in Maranello." Team boss Stefano Domenicali, also confirmed that Massa's participation in the next Formula 1 race in Canada in a fortnight was not in doubt. "Fortunately, despite the violence of the impact, he is fine and has already gone home and I believe that in the space of a few days he will back in perfect shape and ready to race in Montreal," said Domenicali.